We just wanted to bring everybody up-to-date on what is happening since the announcement by ESRD about a cull of 200 head of wild horses. The response from throughout Alberta and indeed across Canada, has been one of complete shock and distain that this is happening. There are those though who totally agree with this and wish it would go further. The young foal near death by the side of a road that was rescued by such concerned citizens has also raised quite a controversy and some individuals want to see it taken away from the safe home it is at now. That shows how much some people disrespect the wild horses and in fact probably everything positive in this world! Here are a couple of samples written by concerned Albertans over the treatment of these wild horses that belong to all Albertans, not just the government or a few horse trappers and meat buyers. I am emailing you, to once again urge you, to reconsider your current plans for the Williams Creek, horse capture pending results of a follow up head count in that valley. This afternoon, myself and two passengers flew over the Williams, and conducted once again, another comprehensive horse count right from the Coal Camp road and up to the two small north valley herds. Our last Monday count was 61. Today, with three people spotting we counted 68. I know you are aware of how easy it is at this time of year, under these current conditions, to find horse activity in the snow and then locate the animals, …. so I can say with confidence that we did not miss very many head. For sure, we did not miss 100 head !! The majority of the horses are within very close proximity of the capture site, and I am certain that you have issued a permit that will remove well over half of the horses in that valley. Your numbers simply are not accurate, or even close at this time, to be used for permitting this capture. Please hear our concerns, and take a closer look at the actual numbers in the Williams, so that a 25% capture allowance of 169 horses does not eliminate over half of the animals we have counted three times in the last week. I hope to hear back from you very soon. Thank you. 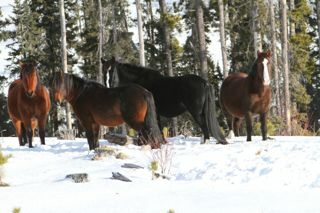 There are many folks who have offered to adopt any captured wild horses. If you want to continue to put pressure on the government, you may wish to sign the online petition at Change.org (search for Alberta wild horses). We encourage everyone to indeed keep doing this and sending in your emails and letters to Minister Robin Campbell and Premier Alison Redford. It is amazing that an elected official in a role such as Minister Campbell, refuses to acknowledge our letters. However, everyone keeps saying to not give up and continue contacting these individuals. Despite all the scientific evidence about the origin of the horse, and indeed about our Alberta wild horses now, the little effect that horses have on the rangeland, their reproduction rates and their part in the ecosystem, the people making the decisions to cull these beautiful animals refuse to look at any of this. Instead they proceed to base this decision on the input of a few people and groups who benefit financially and/or just blame the horse for what we have done wrong to the foothills environment. Maybe they are afraid to take responsibility for this. How can we purchase these horses from those who capture them with permits? Can we place these horses up for adoption or try to find people willing to keep them temporarily until they are adopted? How do we find/purchase/ apply for land where we can bring them that is safe and secure, and what will it take to begin these processes to save these horses that we know will be taken? Thank you two for all you’re doing for the wildies! I called Robin C. so did my sis. Fight on! I’d like to help in some way. I spend a lot of time west of Caroline and want to know if my knowledge of where some of the wild herds have been fairly recently would help you in any way. I also have pictures of some of the herds as well. Where do I find out if there is anything within my power to do to stop this insanity and slaughter of animals that truly don’t hurt anything but are so amazing to watch. I hate the idea that future generations will be robbed of such visions and need to do something about it. thank you. If “they” (who practice Conflict of Interest) are “Just trying to control the numbers” they should make sure the numbers are correct first, which it does not appear to be the case. Shame on the Alberta government. people who registered as part of their infections control program. so they can establish a accurate count on the wildies. We are getting strong support from our neighbors from the south in CA they are in horror that is been done in Canada. not have natural predators as indicated on the news !!! So the cull continues at a full 200 I presume? I hope people will remember this when the next election comes around. Over 11,000 supporters on the Change.org petition obviously means nothing, no round table discussion with other concerned groups , no alternative plans entertained, just what power does the public have to express concerns over government initiatives of any kind? Time for the public to get a little of that power back! My suggestion to the gov’t of alberta would be to capture the horses and sell them to countries as a tourist attraction…..wild Canadian horses….in Quatar, Saudi Arabia, Kuwait…. Sell or give 10 – 25 horses to countries for tourism…. Alberta Gov’t, Alberta Justice are criminals and killers. I am ashamed of the Alberta government! For a horse lover to grow up in eastern Canada and to hear about the wild horses in the west is pretty amazing. To then move to Alberta and find out how disrespected this beautiful indiginous species is shameful! It’s like saying the cull or capture other wild animals is necessary because they are a threat to humans and their property. It just doesn’t make sense. Alberta is a beautiful place and there is more than enough land for grazing for all animals that need it. I would like to think that the government officials are intelligent enough to realize this and to stop listening to a select few that encourage this insantiy for their own personal gain! Who are the officials doing the head counts? Once again, shame on them. I would like them to explain to our children how the Wild horses of Alberta were depleted to near extinction. That would be a story more worthy of nightmares than any scary monster would! Are the permit holders only permitted to take the weak, old or sick? What a shame for evolution if they aren’t! Nature has its own way and is harsh at best! The Wild horses of Alberta are so few in numbers compared to the abundance of land. Will there be any SPCA people involved during and after capture? I know how my horses react to stressful situations. I can’t even begin to imagine the horrors that will be brought to our beaufitul will horses during any cull or capture. Please let me know what can be done to preserve these beautiful and majestic animals. One must realize that without these magnificent animals, our world would not be what it is today. Why would anyone with a heart and soul and a brain to think with, want to cull and basically murder the very animals that have changed the world more than any other? Horses don’t destroy, people do. I know this from personal experience. A horses migratory way retains the environment if only people will allow them to do what is natural.